Notes: Notes: The coastal village of Seaton Sluice (between Blyth and Whitley Bay) developed as a port in the 17th century. Originally known as Hartley Harbour, its present name comes from the sluice gates installed across the harbour on the initiative of the landowning Delaval family in 1690 to trap water at high tide. The gates were opened at low tide to flush out silt. The Delavals owned various coal pits on their estate, including Hartley Pit, about a mile south-south-west of Seaton Sluice. Although an early venture at mining here in 1611 was not a success, the production from this pit was eventually sufficient to justify the construction of a waggonway from it to Hartley Harbour by 1758. 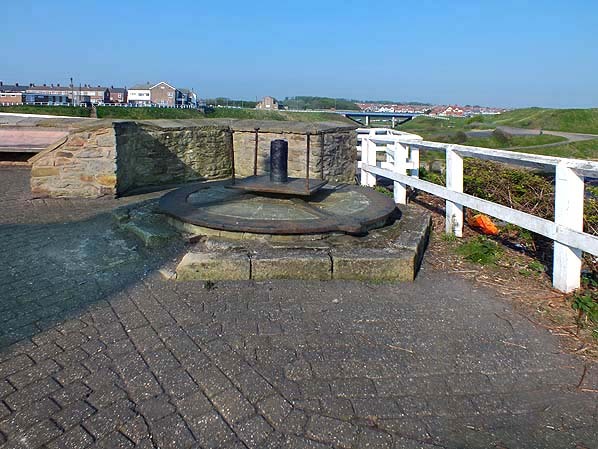 The pit flooded in 1844 and was abandoned, by which time Hester Pit, to the north-west (also known as Hartley Colliery) was in production, and its coal was taken to Seaton Sluice by a connection to the original waggonway. 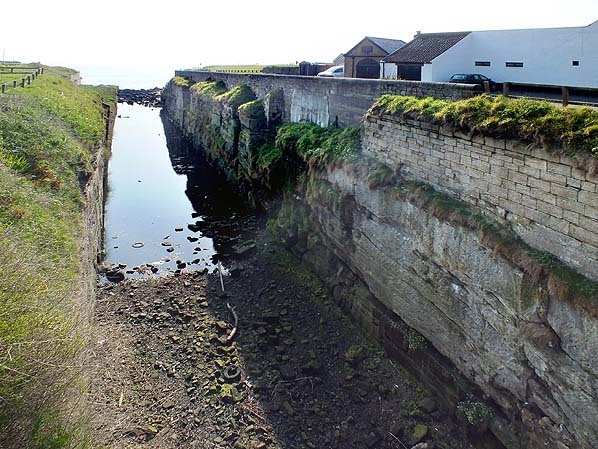 Seaton Sluice became a significant industrial centre in the late eighteenth century with coal mining, copperas and salt production, glass bottle making, shipbuilding and brewing. Large quantities of coal were exported to London. However in the early decades of the nineteenth century the village’s industries stagnated, and there was a short-lived attempt to stimulate tourism in 1843 when a steamer plied twice weekly between North Shields and Seaton Sluice, the fare including tea and fruit in the gardens of Seaton Delaval Hall, a mansion designed by the celebrated architect and playwright John Vanbrugh in 1718. Coal exports from Seaton Sluice ceased in 1866, and the last ship left the harbour in 1872 carrying a cargo of bottles. The chronicler of the North Eastern Railway, W W Tomlinson, visited Seaton Sluice in 1901 and commented, amongst other things, on the almost derelict harbour ‘unused except by a few fishing cobles’ and the waggonway, ‘now a footpath with some of the stone blocks that held the rails still visible in it’. Today Seaton Sluice has a modestly sized residential area spreading south and north-westwards from the old harbour. 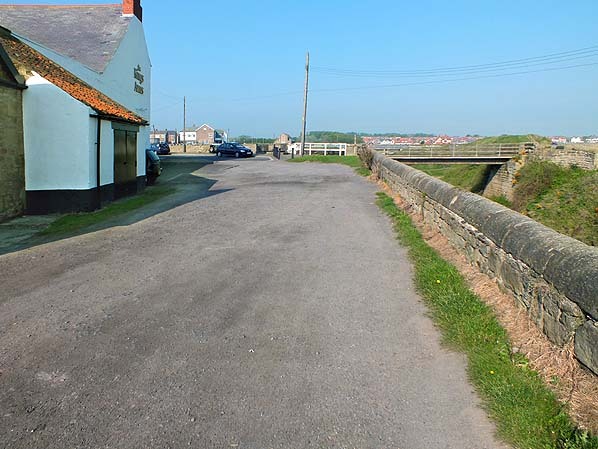 The village was served intermittently by passenger trains on the waggonway between 1851 and 1853, and in 1914 the North Eastern Railway built a passenger branch line to Seaton Sluice from Monkseaton (intending to call the terminus Collywell Bay) but it never opened and was abandoned in 1931. By the 1790s Seaton Sluice had a waggonway from a series of pits along the north bank of Seaton Burn; C R Warn (1978) notes that it was operating from Hartley Pit before 1758. However in 1784 a letter to Lord Delaval from John Crook, his agent at Hartley Pit, includes a drawing of a viaduct proposed to carry the waggonway over the valley of Seaton Burn on its approach to Seaton Sluice by means of a timber viaduct 162yd long and 69ft high. A stationary engine about 100yd east of the viaduct hauled empty wagons up the incline from Seaton Sluice quay. In 1830 Hester Pit (at New Hartley, 1½ miles north-west of the old Hartley Pit) was sunk, whence coal was carried south-eastwards to Seaton Sluice by a waggonway via Dairy House, where it curved sharply north-east to join the course of the original waggonway. From 1 May 1851 a service of passenger trains operated on this waggonway between Hartley Pit and Seaton Sluice on Tuesdays and Saturdays only, departing from Seaton Sluice at 7:45 am and returning from Percy Main at 5:30 pm. Passengers changed at Hartley Pit in each direction. In 1851 special trains were advertised in the Weekly Chronicle from Percy Main to Seaton Sluice on Wednesdays 20 and 27 August and 3 and 10 September, leaving Percy Main for Seaton Delaval gardens at 12:30 pm and returning to Percy Main at 6:15 pm. The implication in the advertisement is that the trains would call at the closest point to the gardens, where the waggonway crossed ‘The Avenue’ about half-a-mile from the Hall: a station was later shown here in timetables of the early 1860s on the Hartley – Whitley Avenue Branch. It is possible that a station was also provided at Dairy House, where the waggonway changed direction. This would have been just over half a mile south-east of the site of The Avenue, and the name appeared briefly in Avenue Branch timetables in 1861. The service between Hartley Pit and Seaton Sluice was operated privately, having had no enabling Act of Parliament. It was advertised until 14 May 1852 – after which date the service was presumably withdrawn – but it was advertised again between January and April 1853. 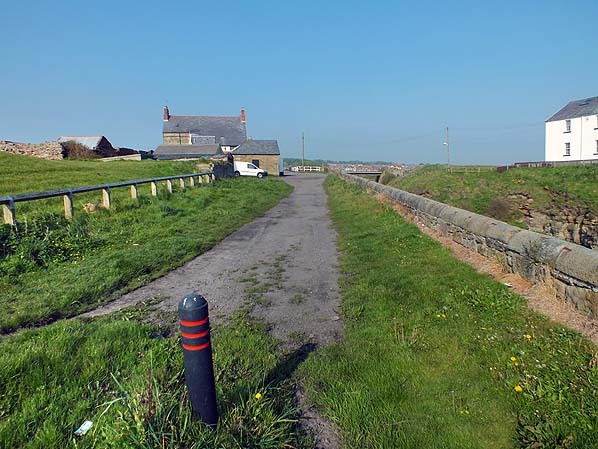 The Seaton Sluice waggonway is believed to have been abandoned in the 1860s or 1870s. There are no known pictures of the Seaton Sluice waggonway but this view shows the similar Little Eaton Gangway with a gang arriving at Little Eaton - note the rails are flanged rather than the wheels. The Seaton Burn waggonway ran on an east-west course through Burradon and Camperdown. It was built by the Grand Allies in stages (1826 and 1837) from Brunton Colliery to the staiths on the Tyne between Wallsend and North Shields. At a later date the line was connected to the Blyth and Tyne railway via a line running towards Backworth. 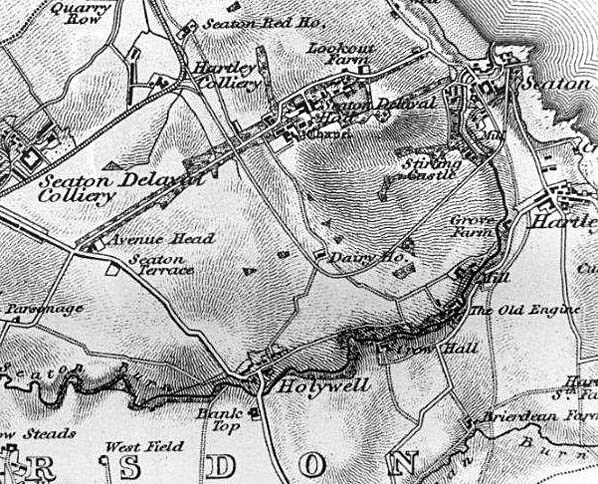 1821 MapThe Seaton Sluice waggonway is shown with several short branches. It is not clear where passengers would later join and alight from the trains. 1828 1:63,360 OS Map. The original waggonway is shown from the coal pit west of Hartley to the harbour, with a branch to the north-west. No viaduct is indicated over Seaton Burn, but it must have been constructed many years earlier. Although the village of Hartley is shown south of Seaton Sluice, the later station of this name was located in New Hartley, 1½ miles to the north-west. 1860 1:2,500 OS Map. 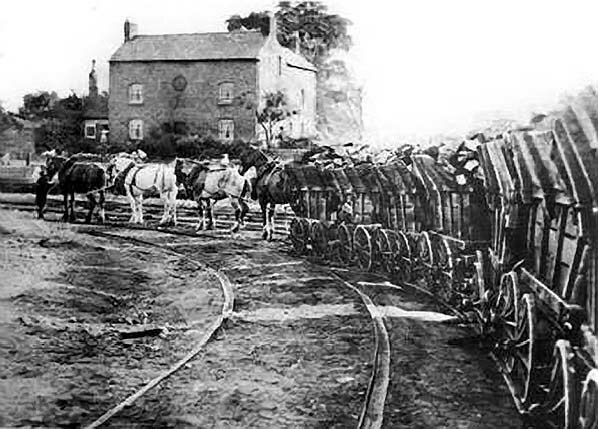 The waggonway is shown, with a branch to the north-west serving coal shoots and the copperas works. 1862 1:63,360 OS Map. The route of the waggonway on which passenger services briefly operated to Seaton Sluice is shown from ‘Hartley Colliery’ (i.e. Hester Pit) where there is a triangular junction. The absence of any conventional sign for a railway to identify the waggonway is not significant, and should not be taken as evidence that it had been removed; representation of waggonways on maps up to this time was inconsistent. It is unlikely that the waggonway had any kind of platform for passengers to disembark. This view shows the course of the waggonway looking west from its terminus alongside Hartley New Harbour in May 2012. This is the likely point for passengers to have disembarked. The building at the end of the road is the Kings Arms Inn which is contemporary with the waggonway. Looking west along the course of the Seaton Sluice waggonway in May 2012. At this point the waggonway turned sharply to the south around two sides of the Kings Arms Inn which is seen on the left. Hartley New Harbour is seen on the right. The base of a windlass or horse gin close to the sharp bend in the waggonway by the Kings Arms Inn. A windlass is shown on the 1821 and 1860 maps above at the end of the line. An unidentified circular structure is shown at the point where the waggonway turns to the east. It seems likely that this was used for haulage on the waggonway although it has also been suggested that it was used for pulling boats through the Hartley New Harbour.